This is the piece that you’ve been looking for, that will define your contemporary home or loft space. Rustically crafted with white-washed angled legs and a gorgeously textured oval top, the Albertine dining table is large enough for all your guests to cozy up to. 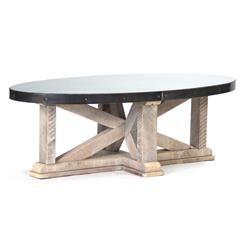 Its industrial construction means this table is virtually indestructible, while its muted zinc top gives it style to spare. Proudly made in the USA; please allow 6 - 8 weeks lead time for production.